Just because summer is winding down doesn't mean the warm days are gone. There is still plenty of time to enjoy a cold beverage under the sun. If you're of the mind that a Slurpee would be nice on an August afternoon, you're in for some good news. 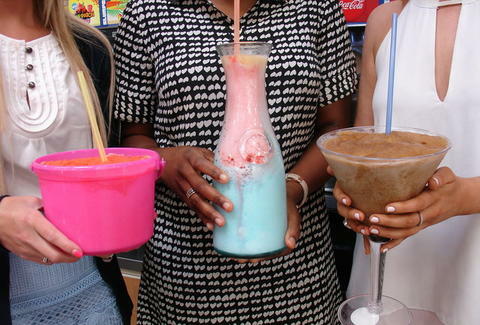 "Bring Your Own Cup Day" is back at 7 Eleven on August 18 and 19. That means it's time to hollow out a watermelon or dust off that novelty baseball helmet. On "Bring Your Own Cup Day" you can bring in your own ridiculously oversized container and fill it to the top with a cold, refreshing Slurpee. The promotion is running those two days between 11 am and 7 pm daily. No matter how big your container is, you'll pay just $1.50. There are, of course, a few restrictions. Your container must be watertight and "food-safe clean." It also has to fit upright within the 10-inch hole under the dispenser, and you're only allowed to bring in one container per day. "Food-safe clean" and water tight means there are two strikes against your urge to fill a sock with Slurpee. It was totally a solid impulse, though. You're definitely allowed to get weird with it.